In 1316 a miracle occurred in Seefeld, giving rise to its importance as a place of pilgrimage. On Maundy Thursday, knight Oswald der Milser came to church and demanded a larger host (bread) than anybody else’s. The priest, scared of offending a knight, gave him the sacrament. At that point, the earth opened up and began to swallow the knight. The host turned bloody in his mouth, and the priest removed it. Meanwhile, the knight’s wife, Dorothea of Starkenburg, didn’t believe this and screamed: “I’d rather believe that roses blossomed on this barren trunk...” Sure enough, roses appeared. She fled into the mountains, went insane, and died. Her husband, the knight, retired to a monastery. Since that time, Seefeld became a place of pilgrimage. In 1516 Emperor Maximilian I founded an Augustinian monastery in Seefeld to provide food and lodging to the town’s pilgrims. The building took almost a hundred years to finish. The monks brewed beer there as an industry—hence the name Klosterbräu. Emperor Joseph I dissolved the monastery in 1785 and the property was sold fifteen years later to the Monastery of Stams. In turn, the Bavarian government dissolved this second monastery and sold the property to Anton Härting. In the 19th century, the Seyrling family married with the Härting family, and it is in this family, six generations later, who own and manage the hotel. Dogs are honored guests here. The hotel offers “5 stars for 4 paws dog service.” This includes feeding bowls and a dog bed on arrival, a welcome gift and daily tidbit, drink stations throughout the hotel, and a special “4 paws a la carte” menu. If you have an aversion to dogs, this might not be the hotel for you. 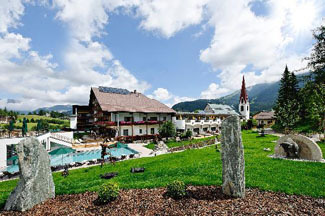 Seefeld is about 25 km northwest of Innsbruck. You can get here by train from there or Munich. The hotel is near the pedestrian zone. Look for the church spire. Yes. Chapel and registry on site. Inquire hotel for more details. No doubt the monks who lived here five hundred years ago could never envisage their holy quarters being converted into a luxury hotel and posh spa, but such is reality in the 21st century. You’re never far away from the monastery’s early origins, from the vaulted ceilings, 1.5-meter-thick walls, and stone cellars to the wide corridors lined by 380-year-old frescoes that depict Seefeld’s host miracle. Guest rooms are classically decorated and most include sitting areas. All have flat-screen TVs and CD players. Many have balconies with varying views, and several rooms have arched ceilings. Come for a romantic splurge and stay in one of the Royal Suites where you can carry on in front of an open fireplace, a bathroom with Swarovski crystal basins, or a canopy bed. The hotel will even reserve the swimming pool for your individual use at midnight. Just say the word and they’ll supply the candles, strawberries, and champagne. And if you wish to leave the property, carriage rides can whisk you through snow-covered woods in winter or to an Alpine meadow in summer. To really experience the historical ambience of the monastery, dine in the magical, stone-vaulted Ritter Oswald Stube restaurant. It is exceptional. An ancient stone vault with meter-thick walls and pillars holds some 6,000 bottles of wine from every region in the world. It’s the perfect place to enjoy a glass. More casual is the Bräukeller, which serves Tyrolean specialties and, of course, beer. Often live musicians perform traditional music, inviting people to get up and dance. Elsewhere in the hotel are more conventional lounges and a nightclub. For 200 years and six generations, the Seyrling family has owned and operated the hotel. The family is very hands on and service oriented.